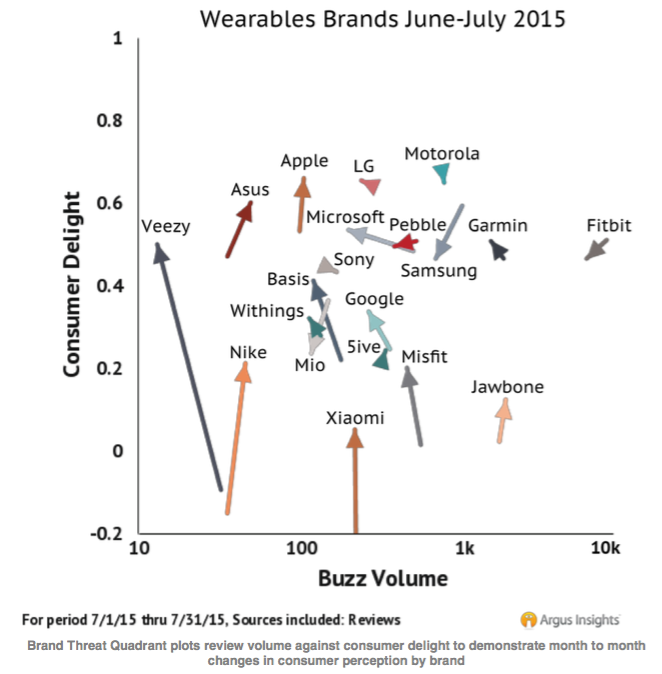 A new report shows a steady drop in consumer interest in wearables. But will the smartwatch save the market? 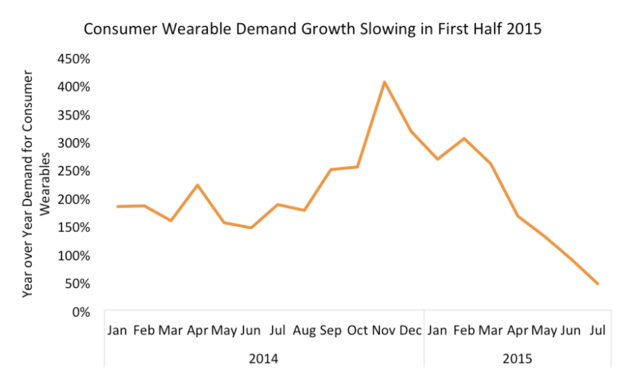 A report released today shows that consumer demand for wearables in the U.S. has declined steeply and steadily since the 2014 holiday shopping season, and is now lower than it was at the beginning of last year. Argus Insights based its report based on more than 327,000 consumer reviews to determine interest in the market over time. The research found that the wearables market was briefly captivated by the Apple Watch in September 2014, but instead gravitated toward the less-expensive Fitbit fitness band for the 2015 holiday season. 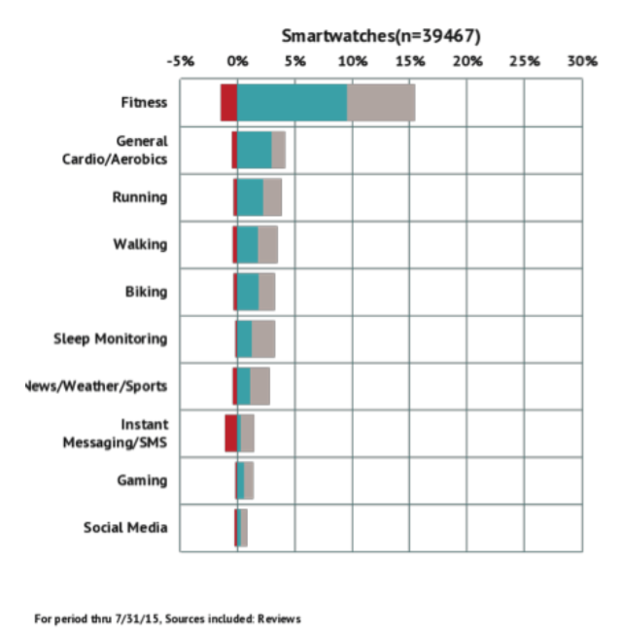 Since then, however, consumers have generally lost interest in wearable devices, as this chart shows. The report acknowledged a similar dip in interest in wearables in early 2014, following a spike during the preceding holiday season, but pointed out that demand eventually rebounded, ultimately peaking by the end of the year. This year, the market for wearable devices has largely failed to recapture consumer interest. However, the wearables market may not be entirely doomed yet. The 2015 holiday shopping season is just a few months away, and Argus Insights suggests that those who are still using in wearables have shown signs of potential growth in smartwatches. While fitness bands, particularly the Fitbit, lead the market in what Argus calls "buzz volume," smartwatches from Apple, LG. and Motorola actually received much higher marks in "consumer delight." This trend correlates with what consumers are looking for in wearable devices now that the market is beginning to mature. Reflecting the overall trend in wearables, smartwatch users have given the most attention to fitness and fitness-related attributes of the device, according to Argus. However, smartwatch users are also showing an increasing amount of positive attention to smartwatch apps for gaming and news/weather/sports (it should be noted that Instant Messaging/SMS smartwatch apps received more negative attention than positive, which is perhaps not surprising given the device's tiny screen). Smartwatches are capable of providing both fitness functionality and news and gaming apps, so therefore they might start to steal away market share, Argus Insights CEO and founder John Feland says. However, the report also cites previous Argus research that found that "the majority of users lose interest in their fitness bands after just six months." While this could signal a move toward more capable smartwatches, it might also be a cause of the widespread drop in interest in wearables. If even the early adopters have become so dissatisfied, why would other consumers care about the technology?